, cosmographer and historiographer to Louis XIII. of France, and regius professor, of mathematics, was born at Beveren in Flanders, on the confines of the dioceses of Bruges and Ypres, Nov. 14, 1565. He was brought into England when but three months old, by his parents, who dreaded the persecution of the protestants which then prevailed in the Netherlands. He received the rudiments of his education in the suburbs of London, under Christian Rychius, and his learned daughter-in-law, Petronia Lansberg. He afterwards completed his education at Leyden, whither his father, then become protestant minister at Rotterdam, removed him in his twelfth year. In 1582, when only seventeen years of age, he began the employment of teaching, which he carried on at Dunkirk, Ostend, Middleburgh, Goes, and Strasburgh but a desire for increasing his own stock of learning induced him to travel into Germany with Lipsius, and the same object led him afterwards into Bohemia, Silesia, Poland, Russia, and Prussia. 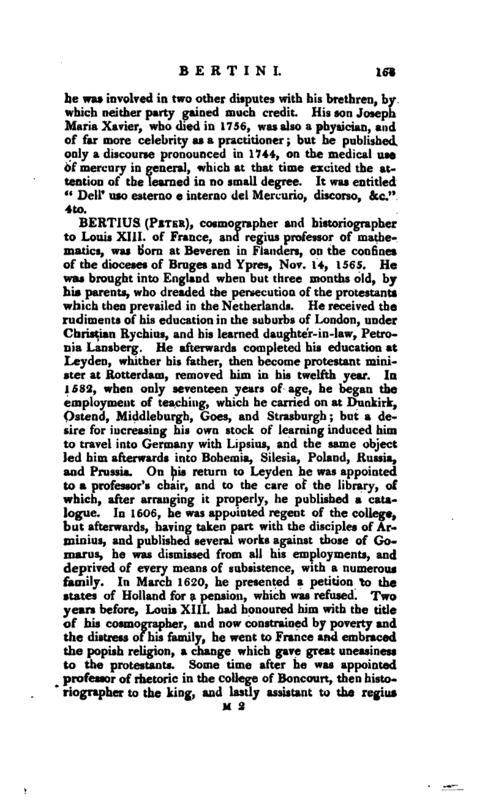 On his return to Leyden he was appointed to a professor’s chair, and to the care of the library, of which, after arranging it properly, he published a' catalogue. In 1606, he was appointed regent of the college, but afterwards, having taken part with the disciples of Arminius, and published several works against those of Gomarus, he was dismissed from all his employments, and deprived of every means of subsistence, with a numerous family. In March 1620, he presented a petition to the states of Holland for a pension, which was refused. Two years before, Louis XIII. had honoured him with the title of his cosmographer, and now constrained by poverty and the distress of his family, he went to France and embraced the popish religion, a change which gave great uneasiness to the protestants. Some time after he was appointed professor of rhetoric in the college of Boncourt, then historiographer to the king, and lastly assistant to the regius | professor of mathematics. He died Oct. 3, 1629. A veryline engraving of him occurs at the back of the dedication to Louis XIII. 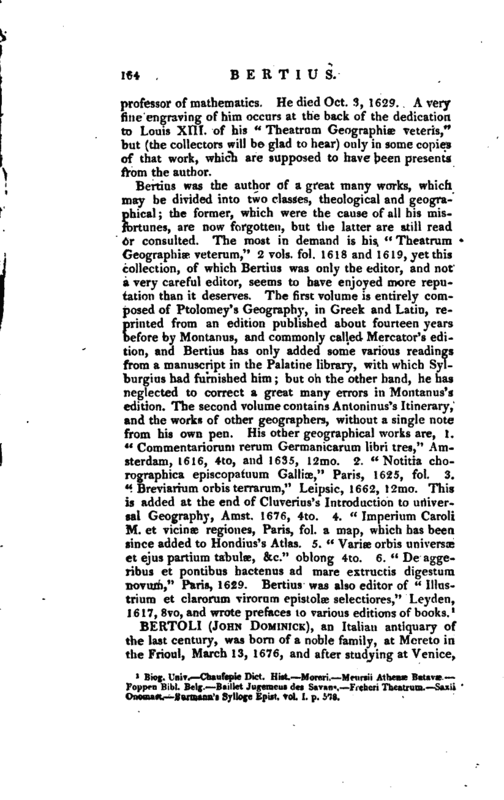 of his “Theatrum Geographise veteris,” but (the collectors will be glad to hear) only in some copies of that work, which are supposed to have been presents from the author. Biog. Unir. —Chaufepie—Dict. Hist.—Moreri. Meursii Athenae Batavae. —Foppen Bibl. Belg. Baillet Jugemeus des Savans Frebcri Theatrum. —Saxii Onomast. Burmaun’s Sylloge Epist. vol. 1. p. 578.